Does the smell of warm cookies make you think of your grandma? Does Old Spice remind you of gramps? Use these thoughts and memories to create Grandparents' Day poems. Grandparent poems make great gifts, and you can use them in a variety of creative ways to celebrate Grandparents' Day. Using special grandparents poems is a unique way to show gratitude and love as well as being a meaningful gesture. There are many poems written that reflect appreciation towards grandparents and express sentiments of appreciation that often remain unsaid. A poem can sum up your emotions and can either be recited or used as part of a gift. Giving someone a special poem written just for them is something that they will never forget. If you plan on reciting the poem, be sure to give a copy to your grandparents afterwards so that they can cherish it for years to come. They may even want to share the poem with their friends. If you are creative, you can always write your own poem. If you don't know where to start why not write a phrase for every letter in the word 'Grandparent'. For example, G is for Generosity, R is for Respect, A is for Always being there, N is for Nice and so on. When writing a poem such as this, be sure to use what is personal and dear to you and your grandparent. Another option is to put a personal twist on a poem that has already been written. Remember to write from your heart. No matter what the poem ends up like, it sure to be appreciated since it is a gesture coming from you. Special gifts such as poems are loved not only because of the content, but because they are written with the recipient in mind. Poems express what is felt but often left unsaid. Show your grandparent how much you care about them with a poem written especially for them. Grandparents' Day is a national holiday observed on the first Sunday after Labor Day. It is not as popular as other known holidays, but it is an important time to thank grandparents, who are often so important to a family. Many make a tradition out of observing the day and plan activities to celebrate the occasion. It's a great time to get family together and express appreciation to grandparents. There are many ways to recognize grandparents on Grandparents' Day. From a simple card to an elaborate dinner, there are endless ideas of ways to show appreciation. A poem is something that is meaningful and will be treasured by whoever receives it. 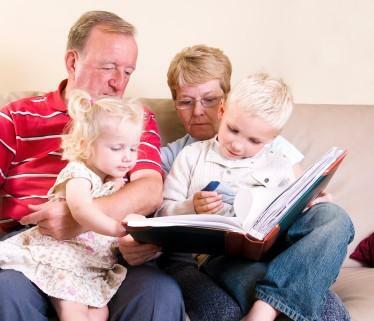 Whether it is recited or used as a gift for grandparents, a poem is like nothing else. Words can often express feelings, and a poem is a great way to sum up your gratitude and love for your grandparents.